to Get Useful Information About Your Virginia Reckless Driving Case! Almost everyone has a basic idea of what Reckless Driving is. But if you thought it was all about driving dangerously, you’d be wrong, at least in Virginia. Reckless Driving laws in Virginia include a lot more than that, and the penalties shock almost everyone who learns about them for the first time. You don’t need to be driving even a little recklessly to be convicted of Reckless Driving in Virginia. Driving even a few miles per hour over the speed limit will do it. Virginia has been called “the most expensive state for a speeding ticket in the country.” It is Virginia’s Reckless Driving laws that make speeding so expensive. Often, motorists only learn the ugly truth once they’ve been charged with Reckless Driving and discover that it is a crime that can entail not only jail time, but more jail time than most charges of drug possession, petit larceny or DUI. Many don’t learn how serious it is until after they’ve been convicted and it is too late! Searching for a Virginia Reckless Driving Attorney and Not Impressed With What You’ve Found So Far? I want to actually provide you with real, useful information about Reckless Driving, so that you can make smart decisions about your case. Call me at 703-361-0776 for a free and confidential conversation about your case. Want to learn about your case before calling me? 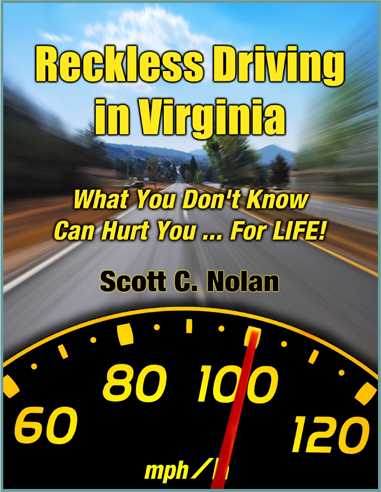 Read my report, Reckless Driving in Virginia: What You Don’t Know Can Hurt You… For Life!